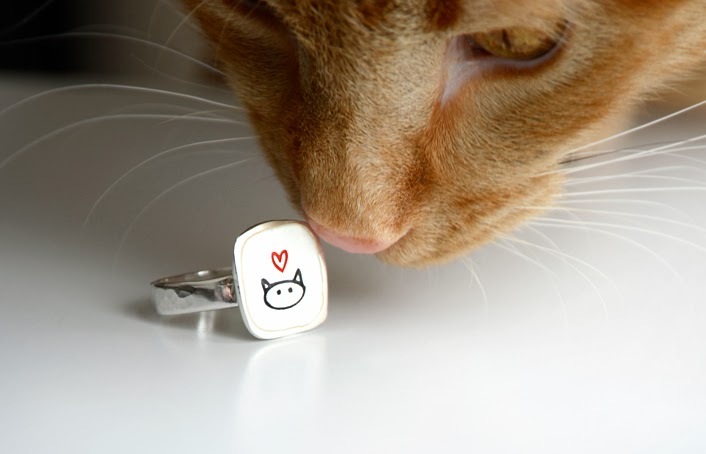 GLOGIRLY: Mark Poulin Kitty Love Jewelry Giveaway! WAFFLES: Hi everybuddy! Look at the ring I'm giving my girlfriend for Valentines Day! KATIE: Waffles! That's for Glogirly... not your girlfriend. WAFFLES: But Glogirly's a girl. WAFFLES: And she's my friend. WAFFLES: And I love her. KATIE: Yeah, but you're not IN love with her. You're not going to MARRY her. 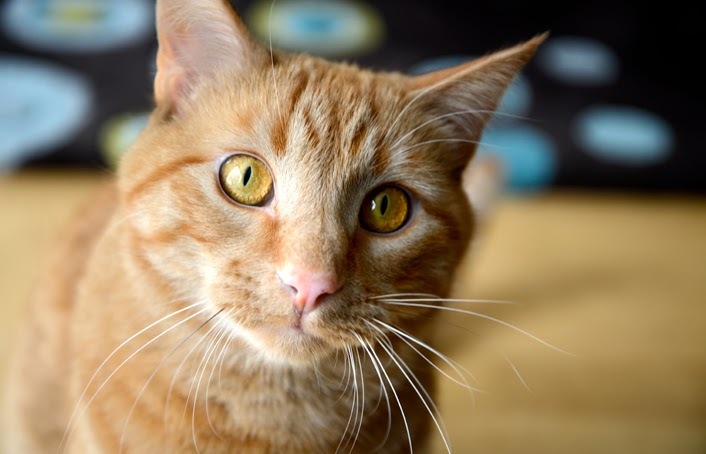 WAFFLES: How do YOU know? Maybe I WILL. KATIE: Well Waffles, I think you better talk to Gloman about this. 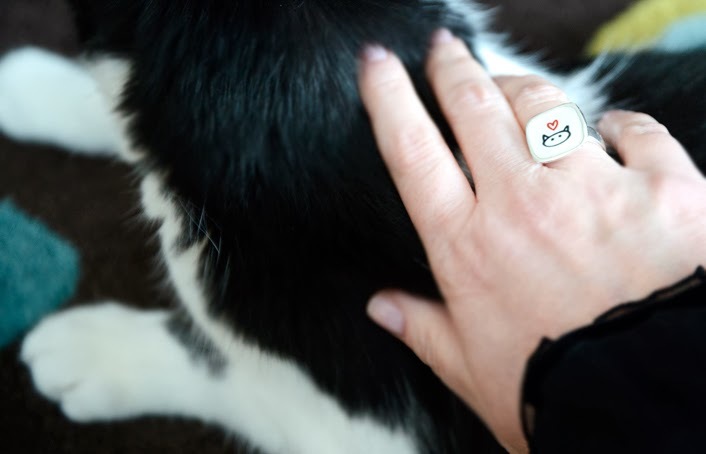 But in the meantime, why don't we tell everyone about Glogirly's new Love Kitty Ring and the SUPER-cool Valentines Giveaway we're hosting from Mark Poulin Jewelry? WAFFLES: Um, okay. But we're not giving away my Valentines present for Glogirly are we? KATIE: No, Waffles. Her present is safe. We've had the pleasure of featuring Mark Poulin's adorably whimsical line of jewelry on GLOGIRLY before. Each piece is beautifully crafted with love and a smile. His designs are clever, modern and full of personality. 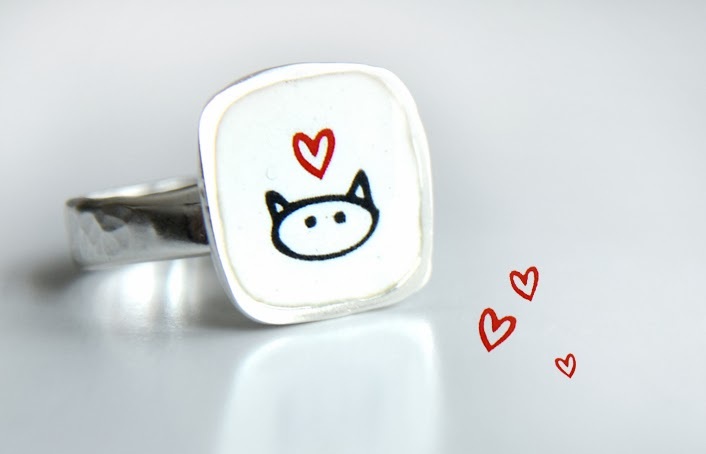 Glogirly's Love Kitty Ring is from their Enamel Cartoon Line and features a precious little black and white drawing of a kitty and his heart on a white enamel background. The sterling silver ring shines bright and, according to Glogirly, feels SO smooth and comfortable on her finger. It's like it was made just for her. Oh wait! It was! The ring can be made in full sizes from 5 to 9. Always tucked inside the package is a surprise greeting card to save for someone really special. And our ring came in this purr-fectly sweet kitty box. Mark always hides a cute little button inside the box with his jewelry pieces. The attention to detail in his designs, packaging and all the little touches is very special. But what's REALLY special is that one lucky GLOGIRLY reader will win a beautiful piece of Mark Poulin jewelry for themselves! Or better yet, for your Valentine. Mark Poulin Jewelry Valentines Giveaway! Enter below using Rafflecopter. The first two entries (leave a blog comment & email address) are mandatory. All other entries are optional. You may log into Rafflecopter with your Facebook account info or with your email. Deadline to enter - 11:59pm EST, Tuesday February 12, 2014. FTC Disclosure: We received this product for review at no charge from Mark Poulin. We also received a small fee to cover the time it takes to test, take photos, and write the review and administer the giveaway. Receiving the free product and the fee did not influence our review. All reviews on GLOGIRLY will always reflect our honest and unbiased opinions. That ring is adorable! I'd love it if my sweetheart gave me that for Valentine's Day. I am SO in love with this jewelry!! I big pink heart Mark's designs! ButMouseSpouse doesn't do much online, or holidays, or gifts, so it's up to me! That is a very cute ring! Oooo I wanna get this for Rumblemum! It's SO cute! OMC we would love this for our Mom!!! Oooooh! This ring is even nicer than the pigeon my Furryboy brought me one Valentine's day (pigeon escaped unharmed). As I am currenty wearing my Marek Poulin jewellery I will NOT be entering BUT I will share this far and wide!!! 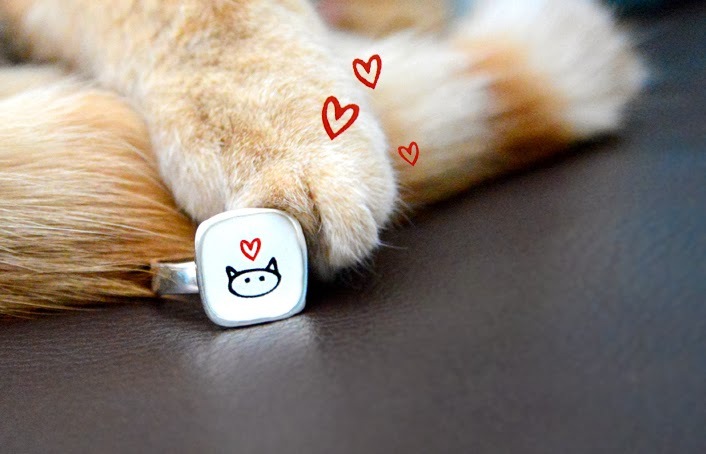 Oh, the Love Kitty ring, just like you have pictured...that's my favorite! This is just adorable! We love the pic with Waffles sniffing it! Pee Ess - Our Mommy says to check your email, she sent you a message. Oh boy! That's an adorable ring! I'm gonna enter! Oh! forgot to say my favorite! I love the Love Kitty earrings! I love the ring too.. what a tough choice, all of his stuff is wonderful! We LOVE it!!! Thanks fur doing this!!! How cute! Are the enamel pieces new to Mark's line? We still like the angel kitty best, though. Oh the mom would love that ring. And if we won it, then we wouldn't have to buy her a Valentine's Day present. This jewelry is so adorable. I'd pick the cat head sterling silver charm ring, so it would go with everything. Just love this collection. I love the make a wish upon a bat necklace!!!!!!!!!!!!!CUTE!!! They're all so cute! My owner thinks that the mother daughter cat necklaces, the sloth necklace, the beaver necklaces, monkey charm, dinosaur earrings, dinosaur charm, and basically everything is cute!! Hope you & Katie are doing well. Paw waves to Glogirly & Gloman too! Waffles what Mom doesn't like jewelry, especially cat jewerly? Happy Dog enamel and Sterling Silver Necklace. I think it's just adorable! Oh a nice kitty pretty - I'd like that! I'd like to win for the lady! I love the design of that ring! Waffles, if Glogirly doesn't want it, I like it. And it'll fit my stump just perfectly! What's more perfect for a Waffles than a Crepes, n'est ce pas? - Crepes. I would love to win the ring. It is adorable. I love it. I am SO,SO in love with Mark Poulin's jewelry! I have a little dino charm bracelet, but I am DYING for the tiny cupcake charm, or to try out some of his beautiful rings! That is so cute! The other stuff on their site is quite adorable too. Too bad I don't wear jewelry. 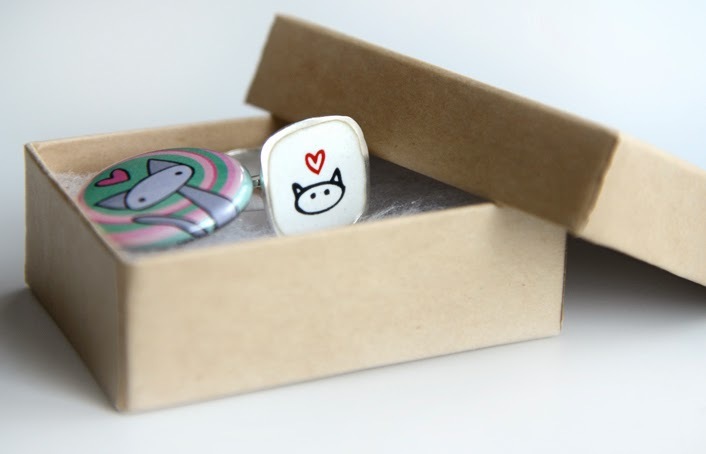 I absolutely LOVE the cat head ring!! I got an angel dog ring in memory of my Lefty. It came in today. I love Mark Poulin's jewelry, so cute! I love Mark's designs, especially the fact he hides the buttons! Would love to win! 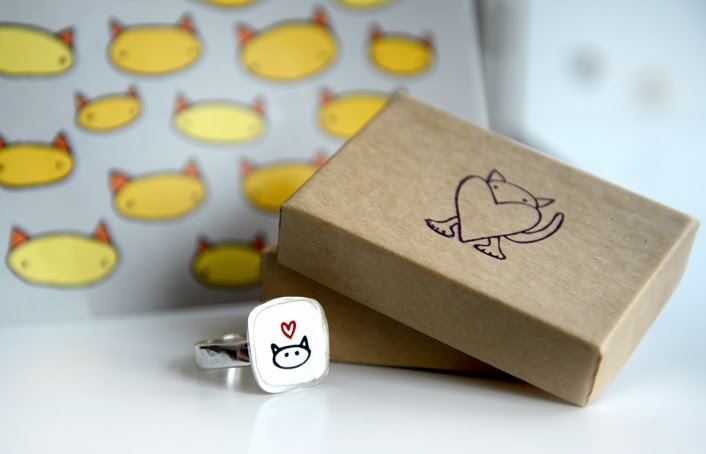 I love the Little Animal ring series - the little angel dog ring is adorable. Very hard to pick one favorite! Little Angel Kitty Necklace is absolutely adorable, but everything made by Mark Poulin is cute. Waffles your sweet face just melts my heart. Gorgeous jewellery too. We love that jewelry! Waffles, you are too cute! His jewelry is awesome. Hope I win! Love your ring Glogirly! It is ALL so cute! Love the rings! Ooohhh... How BEAUTIFUL! What a gorgeous ring. If I won that... If I won that... Why, if I won that, I'd give it to my Peep #1 and then I would be favourite kitty, always. Sterling silver and cats? Purrfect! I love the Little Rocket Cat Necklace! I love mark poulin's stuff I own the catitude necklace. My favorite on the site is the reversable two cat necklace! This ring is absolutely adorable. Did i mention I love cats? Love the valentine hearts earrings! Waffles has a Girl friend! HAH! He’s so sweet. Love Bunny Enamel and Sterling SIlver Necklace so cute! I found several items I really like, but if I could pick just one it would be the Happy Dog enamel and silver necklace. We'd love to win something special for Mom Paula. Oops! We forgot to tell you which piece of jewelry we liked. We like the little pocket cat earrings. I love the Dogstar and Star Chaser Sterling Silver Necklace, its adorable! It's so sweet that your Waffles girlfriend. Such Love!! Really like your ring and I Really like the Sterling silver Tom Cat ring and some of the necklaces. The ring is very sweet. I would like to enter for my mum. I like the space cat earrings. I went to his Etsy store and I am in love with the little charms line completely. I would love to see about a custom one of a giraffe. His overall look is great! That's really cute! I'd love to be able to give that to my Mum. Thank you for sharing the link to Mark's jewelry! I love it all! My faves are the punk kitty pieces. So hard to choose! But I do love the white on black stick kitty earrings/necklace. I love the Happy Dog earrings- reminds me of my little chiweenie, Emiline. and I doubt he'll ever notice me.. I love his designs - really whimsical and fun. This is so cute and we'd love to be involved in the raffle. Cat jewelry is the best! I love the Star Kitty and Stick Kitty Tiny Ne.